Whenever I find myself in crisis mode, I throw on my running shoes, turn on my Spotify motivational mix, and blow out the door for an intense 45 minute run surrounded by Mother Nature. The beating of my feet on the asphalt to old school rap or Katy Perry’s latest tune knocks all stress from my bones, and it is the only moment of the day when I am one with myself as a woman. My daily challenges flip through my head until the huge roar becomes one with the hum, and my clogged brain embraces an unexplainable sense of freedom, finally. I do not know how I would maintain my sanity without my daily run. In the US, women run to promote causes, to fundraise for children in need, or simply because we have an intense love of running. 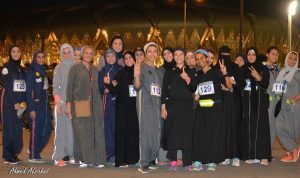 Until recently, women in Saudi Arabia were prohibited from running. Cheers to International Women’s Day: Raise Your Voices! Pad Man Fights Menstruation Injustice: Strike a Pose! Get $6.00 in Organyc coupons by answering several questions about your experience. Click here. It will take just two minutes and we never share information.